David Haskell’s award-winning The Forest Unseen won acclaim for eloquent writing and deep engagement with the natural world. Now, Haskell brings his powers of observation to the biological networks that surround all species, including humans. 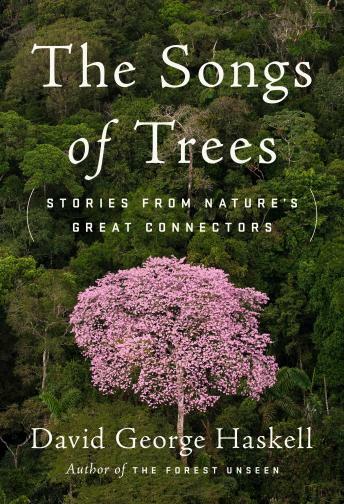 Haskell repeatedly visits a dozen trees around the world, exploring the trees’ connections with webs of fungi, bacterial communities, cooperative and destructive animals, and other plants. An Amazonian ceibo tree reveals the rich ecological turmoil of the tropical forest, along with threats from expanding oil fields. Thousands of miles away, the roots of a balsam fir in Canada survive in poor soil only with the help of fungal partners. These links are nearly two billion years old: the fir’s roots cling to rocks containing fossils of the first networked cells. By unearthing charcoal left by Ice Age humans and petrified redwoods in the Rocky Mountains, Haskell shows how the Earth’s climate has emerged from exchanges among trees, soil communities, and the atmosphere. Now humans have transformed these networks, powering our societies with wood, tending some forests, but destroying others. Haskell also attends to trees in places where humans seem to have subdued “nature” – a pear tree on a Manhattan sidewalk, an olive tree in Jerusalem, a Japanese bonsai– demonstrating that wildness permeates every location. Every living being is not only sustained by biological connections, but is made from these relationships. Haskell shows that this networked view of life enriches our understanding of biology, human nature, and ethics. When we listen to trees, nature’s great connectors, we learn how to inhabit the relationships that give life its source, substance, and beauty.